If you are looking for a stylish outerwear piece to wear this spring, an ecru trench coat is exactly what you need. You will be extremely surprised with the amount of saucy outfits one can create with the help of this adorable item. Ecru itself is quite a trend, but when it is combined with such fine designs as presented below, it becomes incredibly hard to resist the temptation to get yourself such a clothing piece. Therefore, I suggest that you do not waste a single minute and set in this exciting journey with the 10 most gorgeous coats white, beige and cream. Here is an adorable way to dress up this spring. If you are into total white outfits, then you are most likely to love this gorgeous ensemble. And the best thing is that you do not have to worry about the functionality part of the outfit – since it is spring that we are talking about, you should not get concerned with your clothing pieces getting dirty. The number consists of quite simple yet very appealing items: this superior mid-ankle coat in precious cream is combined with a matching pair of curved shoes and a trendy clutch. The only element in a different color palette is a pair of stylish eye glasses which makes this look very much complete. In case you are more into casual and somewhat sporty looks, then this is something you ought to check out. I am fully in love with the bold and cool vibe that this look is full of. A pair of straight leather pants in black is combined with a long white chiffon shirt and a crop sweater in cream over it. In addition to that, the fashionista rocked a lovely trench coat in ecru along with white and mint running shoes and a handbag in black. Jeans can be complemented with anything and you are guaranteed to get a saucy look. This time is no exception, as this outfit looks very stylish and hot. Ripped up denims in bleached blue are paired with a classic white shirt and an awesome coat in beige. A pair of leopard printed pumps and a handbag in black finish this outfit and make it quite hard to resist the power of the number. Why not to go for the contrast and combine a midi coat with super short shorts? This lovely piece in cream features very intricate embroidery, which by all means is the main element of the design. The curly trim of the coat adds up to the overall impression, whereas beautiful color makes it impossible to not fall for it. Very bold denim shorts in light blue and a light knit sweater in beige as well as black lacquered shoes brought the final touch to the look. If you would like to get an idea on something more glamorous and go-out, then this is the rightest thing to go for. A pair of sky-scraping sandals is something that will attract any attention, so the main goal will be reached anyway. This gorgeous quilted and embroidered coat in cream is a perfect solution for those who want to shine and allure. What else if not such a coat will delight you and bring more inspiration? If you think that coats cannot can be rocked along with flip-flops, here is a very strong image that will prove wrong. A crystal white skimming dress is combined with low-heeled flip-fl0ps in white and a a chain handbag in black. A very light and floaty coat that reaches one’s mid ankle will definitely speak to many of you and is likely to may your spring day more sunny and positive. You can definitely some more of the vibrant shades into this outfit, but then the very essence of the look will be lost. Lastly, here is a look that I myself would like to try on. First of all, I am into fashion combinations. Be it a mixture of colors, textures or styles, outfits like this one seem to be very compelling to me. In this case we are talking about a saucy and very cool coat in cream, which is paired with a baggy turtleneck in cream, a midi embellished skirt and a pair of adorable white oxfords with a white heel. A cute fur clutch in brown along with sophisticated eyeglasses and a whole bunch of stylish accessories completed the fascinating look. 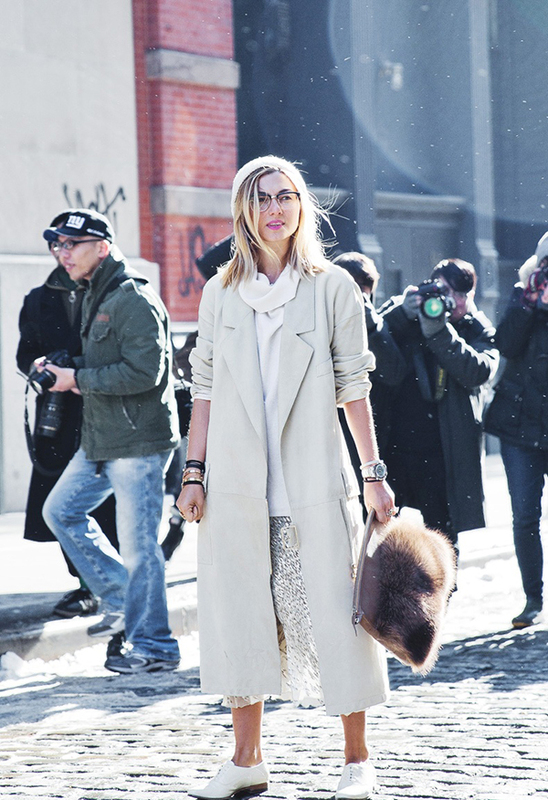 These were the most adorable looks featuring a coat in ecru. What do you think about the presented models?